Not to brag, but around these parts, and parts of Central California where I spent many years, I’m known for my cookies. Yes, in the scheme of things, I realize this is a sad, pathetic talent to be known for. I have a husband who is an accomplished artist, a son and daughter who are incredibly creative and talented. I cook. Specifically, I bake. This is not impressive. But if you are hungry, I can provide you with tasty treats. I bake most days of the week and have since I was a teen. So, I am pretty committed to my gigantic KitchenAid mixer. In fact, as ridiculous as this sounds to those of you who don’t enjoy time in the kitchen…If my family was safe and I had five minutes to grab stuff out of the house before it collapsed, it would probably be the photo albums, hard drive with photos, kid art and KitchenAid. Until the event I am about to disclose, I didn’t even know just how radical my KitchenAid mixer was… I knew it was heavy, beastly even. No joke, this bad daddy weighs over thirty pounds. Now you know why I do 100 push-ups/day…I need to be strong enough to hoist this baby onto the kitchen counter and back into the cupboard. Princessenpointe didn’t weigh 3o pounds until she was over two years old! I received my KitchenAid mixer as a gift for Mother’s Day about a decade ago, so I did no research, information gathering, etc. I only knew it could mix a quadruple batch of Snickerdoodles and whip just about anything else into smithereens in seconds. But, now I know it is a Professional 6. This is one of the bad daddy models. 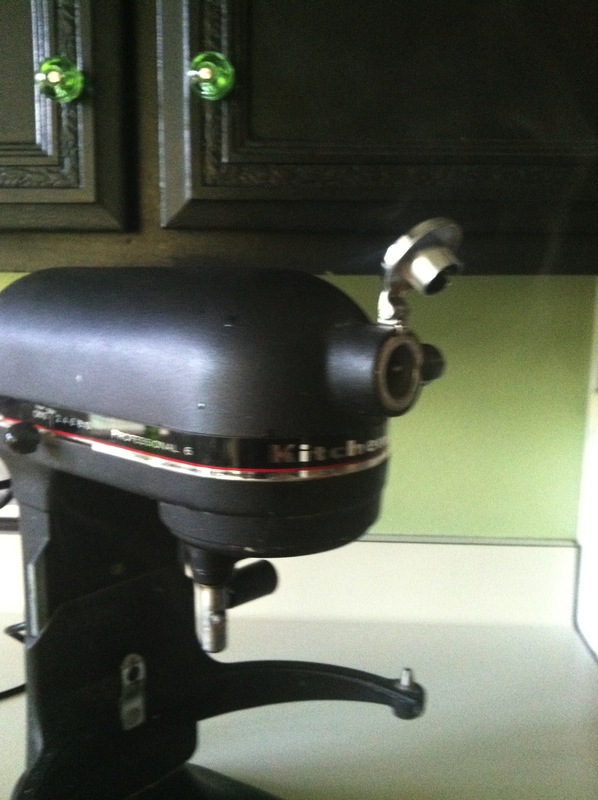 I know this because I was mixing whole wheat pizza dough the other day and the KitchenAid started smoking…smoking as in big plumes of smoke spewing from the back and from the front. I was out back watering the plants while it mashed my dough for six minutes and when I came inside, the kitchen was smokey. Does this make the pizza “electrically fired?” It’s a new take on “coal fired”…only instead of firing the dough in a coal fired oven, you fire the raw dow in a broken down KitchenAid. EEEEK. I was afraid to unplug the cord from the electrical socket. Mind you, both Princessenpointe and Princelightningbolt were nearby and neither noticed the smell or the smoke. So, if you invite them over to your house, be sure your smoke detector has new batteries because they probably won’t notice that your house is burning down. Long story short, my KitchenAid is at the repair shop getting new motor parts. I lasted one day without it and had to borrow Mrscooksalot’s extra. This extra mixer is a bitty, bitty baby compared to my bad boy, but it will do until I get mine back. I’ve made some macaroons in it and they are delicious, but I still feel like something major is missing from my life. Look closely…there is a little plume coming out of the front of the mixer..this is all the smoke that was left after I freaked out for a few minutes, unplugged and thought to go get my phone for a picture…Next time I will be quicker to get the shot.